AIDA is a framework and online tool for entity detection and disambiguation. 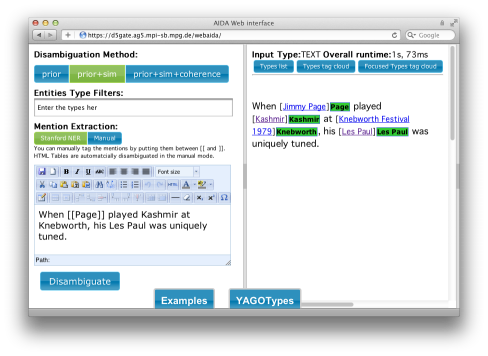 Given a natural-language text or a Web table, it maps mentions of ambiguous names onto canonical entities (e.g., individual people or places) registered in the YAGO2 knowledge base. You can try AIDA on any text you like in the online demo. To experimentally verify the quality of AIDA, we annotated nearly 1,400 newswire articles with the entities mentioned in each article. This collection is available for download (see Downloads). Discuss AIDA with us and other users by joining our mailing list. Send a mail to aida-users-subscribe@lists.mpi-inf.mpg.de or sign up at https://lists.mpi-inf.mpg.de/listinfo/aida-users. Find all datasets related to AIDA in our downloads area. More information is available in our web service description. Please do not use it for comparison in scientific papers or for running time experiments, as the service changes continuously. If you want to compare AIDA for research, please download it and set it up on your own machines. Please use either Firefox or Chrome to view the Demo. In the EMNLP 2011 paper, the results are given on the subset of 228 CoNLL testb documents wich could be processed by all the competitor methods (1270testb, 1308testb, and 1349testb are missing). We did this for the sake of comparability. The results of our AIDA methods on all 231 CoNLL testb documents are given below. The short names are the same as in the paper.